Accounts of Hastings make the plausibility of frequent pauses in combat more explicit. The English held the hill crest. The Normans picked at the English line but were repeatedly repulsed. This went on for most of the day. If the Norman infantry had been in continuous contact with the English shield wall all day, they would have been banging against the a thick shield wall while facing uphill while the English could pushing downhill with their spears and gravity on their side. 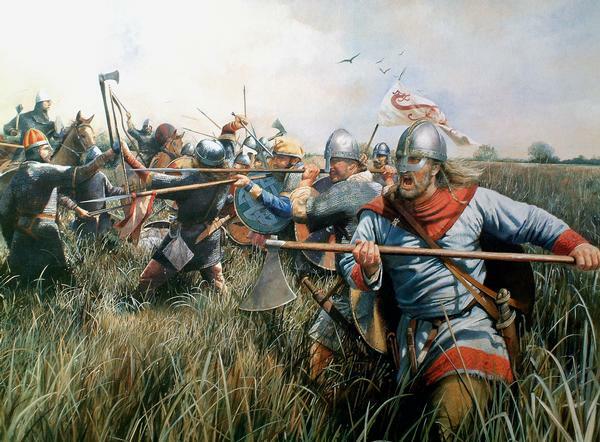 in line with the thesis proposed, the turning points at Hastings seem to have been overenthusiastic fyrdmen breaking line to chase down fleeing Bretons, Once in the open, they were chased down by Norman cavalry. Then, once Norman archers found their range, the huscarl core of the English army behind the shield wall was thinned from above. As the English line buckled, the route became so general that a significant percent of the English aristocracy died, leaving the English establishment to collapse almost as completely. Even at Cannae, with 20,000 to 50,000 Romans supposedly trapped in a killbox, would have seen frequent pauses. The physical effort of killing that many armored men, even and especially if they were packed like sardines, would have tired out even men whose sole task was killing nearly defenseless men. The task might have been easier if Hannibal left an escape route open so Roman soldiers would split into small isolated clumps of broken men, every man for himself, that his cavalry could run down. Something of the sort may have happened though there's little hint of it in the historical record. Many others who read the post have questioned whether it is appropriate to use a video of one on one sparring competition to illustrate a point about the nature of pre-modern group tactics. It wasn't my intention to argue that the type of close quarter combat shown in the footage mirrored the dynamics of a legionary formation at war (though looking back I can see that my language was ambiguous enough to allow this interpretation). I find video footage of modern sparring useful for two other reasons. The first is that it immediately debunks the way battles are portrayed in most popular sources. In this "Hollywood style" of battle, once the two sides meet they tend to get mixed in with each other, devolving into a series of one-on-one exchanges. Fighting in this fashion the hero will then mow his way through dozens of opponents. As the sparring footage shows, this image of ancient warfare is nonsensical. Most close quarter combat exchanges last only a few seconds. It is very easy to die in such an exchange. Survival turns on a few split second decisions, and if these decisions had to be continually made (as would be the case in the Hollywood style of battle) the warrior in question would die sooner than later, even if he was a far better fighter than average. Fighting this way is suicidal. No army could tolerate doing it. Most of us live peaceful lives far removed from war and its horrors. One consequence of this that we sometimes forget how easy it is to die. Sparring footage reminds of us this reality in a very visceral way. This is the second reason I find it useful. It reminds us of things no soldier in the pre-modern world would have forgotten. They knew that close quarters combat was a terrifying experience. I would argue that the central purpose of fighting in formation was to make warfare tolerable. One-on-one combat does not tell us much about what group tactics looks like, but it tells us a great deal about why mass infantry tactics were necessary. The purpose of a unit like the maniple was to ensure that its members never had to face the terrible odds of the duel. And to this end it was largely successful. Sabin notes that the victors of Roman battles rarely lost more than 5% of its manpower during any given battle. When pre-modern infantry formations stood strong they were very effective at keeping the men fighting safe. It is only when discipline broke and the rout began that one side was able to inflict death on the other. Hastings is an example of a shield wall that holds. If you have two forces that use the shield wall as their method of attack, than the battle could be very drawn out. If there was some sort of obstacle, or one side decided to be particularly stubborn the battle could also go on for some time. You do have some fairly good examples of pikes in action. They date from the 15th-16th century with the Swiss and Germans in action. With the better trained troops, you don't tend to get much too long of a battle. The Swiss charged, and that was usually it. There isn't a scrum with pikes in the rugby sense, or likely with long spears either, because if a spearman pushes to far forward with his point, beyond the front line, he likely will loose his spear. Thus the two sides will smash into each other, but then likely recoil a little bit when faced with no opening in the opponents shield wall. At this point, if available, you would get specialized troops (Swiss= halberdiers, Spanish = Sword and Buckler, Germans = two-handed sword, English = Bill-hook, etc.) who would try and chop away at the hedge of points and cut a hole into the shield wall. In the case of the earlier armies you noted, it was likely the officers who were leading the way in this process. So long as the line held this would take time as each side plugged any holes that formed. Once one side broke through an opponents line, the collapse would be fast, and the casualties very one sided. So your combat is one big charge with winner take all. If there is not a clear winner both sides settle into a desultory battle with very little way to gain an opening without exposing yourself. If you look at the various German wedge formations, the crazed Galatian or Berserker charges, they seem to be an alternate way to maximizing the initial rush. The Romans generally felt that if they could hold these initial rushes, their better training/discipline would allow them to win the second stage of the melee. I've read an account of an action in Korea which bears on this. During a trench raid, a man with a sharpened entrenching tool -- essentially a short heavy ax -- rolled into a Chinese trench while the rest of his squad made a demonstration a short distance away. He went down the trench and killed between 15 and 20 men in only a few minutes -- essentially, killing a man every second step in a ceaseless flurry of lethal blows as he rushed down the trench in semi-darkness. There seem to be a small percentage of "naturals" in close combat, "aces" if you will, who do a disproportionate amount of the damage personally and who pull others along by example. They strike effectively with full commitment every time and without hesitation or thought, over and over again, and -don't stop-.